This has been a long term project that our family business has been working on for the last 3 years. It’s a bigger sister venue to The Chimney House - which allows us to creatively present a beautiful lifestyle orientated space for up to 200 guests. Take a building from 1889 and add a restoration project that has spanned 3 years - and you’ll find The Mowbray. The Mowbray embodies the boldness of British architecture with the softness of beautiful and thoughtful interior design and a gentle narrative of luxurious styling and environment. Revealed behind original factory doors on a historic ground floor of a building built in 1889. The Mowbray is an independent private events space for up to 200 guests that has been 3 years in the making. We’re proud to present a historic yet modern setting for daily meetings, away days, training sessions and conferencing as well as hosting the most beautiful occasions for all of life’s celebrations from weddings, anniversaries and birthdays. Dedicated to representing life and style through beautifully crafted events, The Mowbray draws together an appreciation of finding joy in simple pleasures and collections of experiences that ultimately lead to a feeling of belonging and comfortableness. Our aim is to inspire you with hospitality, great food and drink, architecture and design that feels cosmopolitan and meaningful, yet down to earth and accessible. Explore the three year restoration of a building from 1889 and discover antiques and architectural lighting - including a gigantic feature chandelier built entirely from glass shells from the 1940’s. Notice tiny details and delights along the way from cutlery from Sheffield’s W.Wright, Peak District blooms from our house gardener Marianne Slater, owner of Frances and Rose and soft floral sensory notes floating on the air from our bespoke blend, custom made from Essence and Alchemy. Explore further - through 150 year old rooms and head upstairs to a private roof garden complete with British blooms, herbs for the kitchen and bar and carefully curated planting reflective of Neepsend heritage and environment. 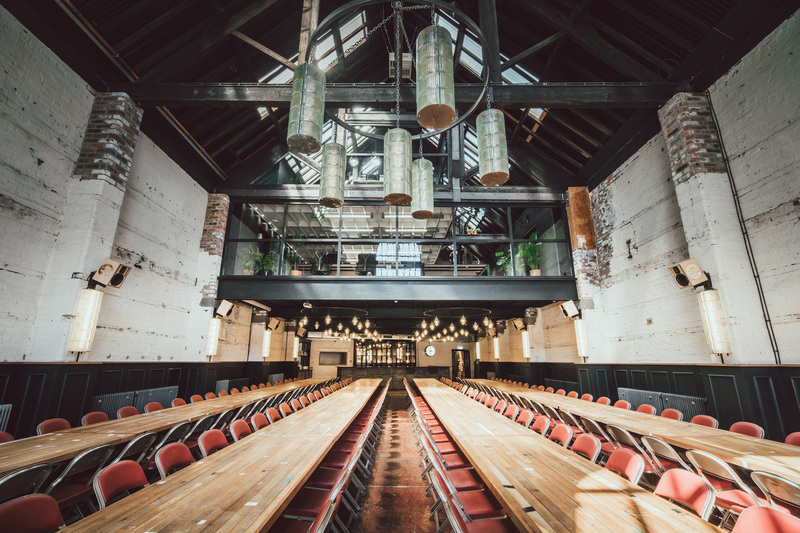 A restoration project that has spanned 3 years, The Mowbray is a culmination of hard work, endeavour and spirit to transform two derelict buildings into one that champions our Sheffield heritage through bricks and mortar, feeling and soul. The entire restoration has been masterminded by our award winning agency 93 who sit in a state of the art studio in the rafters above The Mowbray. From here we have created bespoke furniture and lighting designs especially for The Mowbray including chandeliers, wall lights, the bar, tables et al. These designs have been made in our Kelham Island workshops - a few steps away from The Mowbray. Antiques and key pieces have been sourced for their beauty and story - as well as bringing a feeling of deluxe choice and originality. We've been collecting pieces for this very purpose for years and each piece has been restored in our workshops. The Kitchen is at the heart and soul of The Mowbray, Private dining, business dining, weddings, anniversaries, birthdays, fine, casual & feasting style from when the sun rises until the stars come out, we’ve got it covered. For lovers of our Sheffield heartland and supporters of local, regional and Yorkshire food explore our seasonal menus and enjoy the luxury of one to one consultations with our chefs Emma & Matt Tophill-Reed. Gather with friends, family, colleagues and feast around long easy tables using luxury Sheffield cutlery crafted by our friends at W. Wright just a step away from The Mowbray. Geared up to be a state of the art environment for an inspirational space for business. Use The Mowbray for your daily meetings, away days, training sessions, workshops and conferencing for up to 200. Completely tailored to supporting your team get the very best out of their day 'out of office' we've got every last detail covered. From luxury touches including the comfiest of chairs for day while evening to freedom of space in an extraordinary triple height rafters retreat. We've been hosting professional meetings and creative workspace for almost a decade at our sister venue The Chimney House on Kelham Island. Let us take care of breakfast, mid morning snacks, lunch, afternoon teas, supper, dinner and everything in-between from The Mowbray Kitchen and if you fancy a cold glass of champagne to toast the day or a pint to seal the deal then we can help with that as well. Luxuriously complete - The Mowbray team are experts in making it all happen. We work with some of the leading names in life and style who assist us to create events with soul. We look after everything from venue styling, table settings, floral abundance, food and consultations, bespoke cocktails and carefully curated wines and beers. Our ethos over the last 9 years at The Chimney House has been 'let us look after you' and this forms the foundation of The Mowbray. We encourage you to luxuriate in the knowledge that time and style are on your side and we will attend to the smallest of details with creativity, flair and an understanding of simple beauty and elegance. We’re proud to be based in Neepsend - rich in Industry and honest trade - it’s the sort of place where you can stumble upon real heritage and ‘old ways’ of an industrial area and see new beginnings of a new generation start to appear and flourish. We’re really relishing exploring and living in our area. We’re right across the rooftops and over the river as the crow flies to our first love - The Chimney House - nestled on the waterways of Kelham Island. But The Mowbray is truly a Neepsendian. We’ve become fascinated by Neepsend - even through we’ve been working on the building for years - there are still wonders to behold - the rush of a secret cargo train, unexpected pathways and the ability to plunge into wildlife and foliage via the weirs waterway network at any given time. We love it round here - as you really feel connected to the City on a physical level yet detached enough in spirit to feel wild and spontaneous. Neepsend has a historical pleasure that we’ve latched onto with gusto. Intriguing tales and stories that span back to when time began fill us with delight - especially a Nordic connection and the architecture of landscapes that have risen and fallen through the ages. Discoveries and artefacts found in the locale give us inspiration and make us eager to preserve and document. We'd love to show you around! Have a look over our mini- Mowbray-zine - which in time will develop to show a fuller view of life at The Mowbray - and be super sure to sign up to come and have a look-see at our first LOVE event!